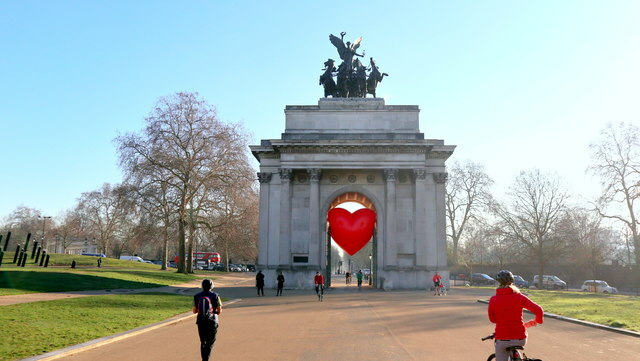 Wellington Arch, also known as Constitution Arch or the Green Park Arch, is a triumphal arch located to the south of Hyde Park in central London and at the western corner of Green Park, where it is isolated on a traffic island. Built nearby between 1826 and 1830 to a design by Decimus Burton, it was moved to its present position in 1882–1883. It once supported an equestrian statue of the 1st Duke of Wellington; the original intention of having it topped with sculpture of a "quadriga" or ancient four-horse chariot was not realised until 1912. By my reckoning, on the extreme left of this image Basher has captured the steps up to number 46, from which address Lord Lucan disappeared 40 years ago today.